Cruz has just been accepted into the elite Explorer Academy, which only accepts 25 students per year. In the midst of his classes on anthropology, science, geography, history, and conservation, Cruz also has training sessions in a virtual reality program designed to prepare the students for real-life exploring all over the globe. Then Cruz starts to receive threats from an unknown enemy, and discovers a mystery in the school. His mother died working in the top-secret labs at Explorer Academy, and Cruz is determined to find out what really happened to her. I loved this book so much! 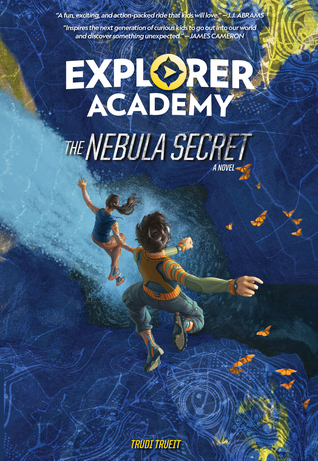 The adventure, the mystery, the engaging characters, the impressive setting at the Academy… I love it all. But the best thing of all… the puzzles and codes!!! I LOVE puzzles and codes. The plot is full of twists and turns, and there is so much history and depth to the story as Cruz discovers the murky past of the Academy. His mother’s mysterious death provides a serious counterpoint for all the fun explorer training and student shenanigans. I was really pleased with the futuristic tech in the Academy, from the virtual simulations to Cruz’s tiny bumblebee robot. It’s all so fascinating, and creates a rich setting for the story. Cruz is such a relatable character. He has drive and energy that propels him into adventure, and he has a very high sense of honor and truth that is the foundation of his relationships with other characters, including friends and teachers and his family. I felt like I was racing along with him through every scene, puzzling through the mystery with him, and going through all the emotional ups and downs of his experiences right by his side. I cheered when he won, and clenched my fists when he was in danger, and cried a little when he mourned his mother’s death. All the supporting characters are memorable and refreshing. Cruz has friends among the students, and some frenemies too. The friends build trust and rapport with one another, and then they get annoyed at the frenemy characters who are trying to make trouble. I really enjoyed seeing Cruz in class interacting with his teachers, since I am a teacher, and I love the classroom dynamic and the students’ enthusiasm for learning. I also appreciated actually learning some real facts about exploring and conservation along the way! His close relationships with his father and aunt are the root of Cruz’s character, as we see how they guide and support him with their family love. I just adore the depth of those family ties. I would recommend this book to readers aged 8 to 80 years. I can’t wait to read more from this series!